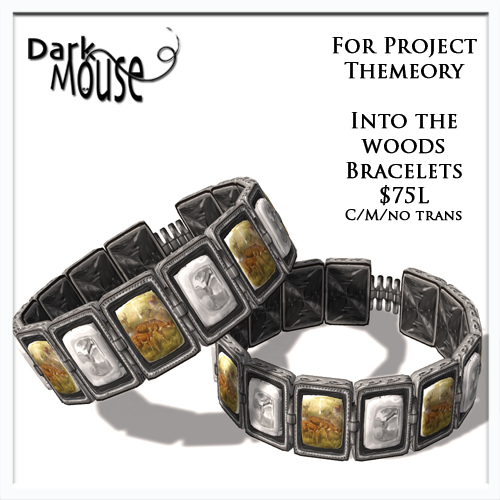 SALE at Dark Mouse Jewelry! 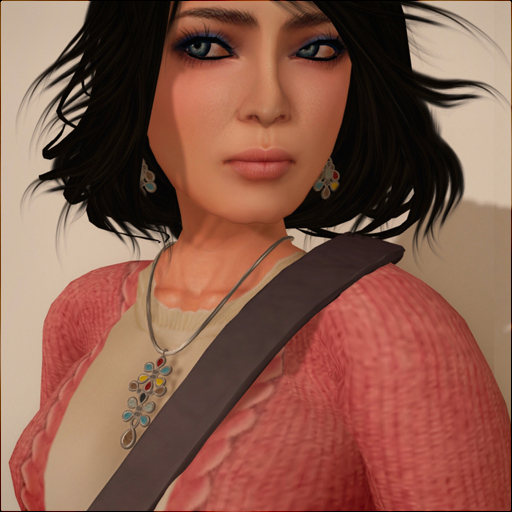 Hi there – I am having a sale at the store, I’ve marked down numerous sets of jewelry – a single set is now $50L, and the fullset or fatpack is $100L. This is a great opportunity to pick up some great pieces at bargain prices! All the sale items are in the small shop behind the main store, just walk out the back door of the store and you’ll find it along the path to your left. In addition to the sale, all my GATCHA items are now out in the store – there’s a winner everytime! Here’s a small sampling of pic of the items out for sale now! And as always, there’s some great stuff in the Lucky Chair, and the Wear & Win Vendor! Last but not least, all my new items from the Jewelry Fair are now out in the store and everything is posted on marketplace! Here’s a teleport directly to the Dark Mouse store. Hi! I’m participating in Project Themeory this week, and I hope you’ll stop by my shop and take a look. The theme was, “Oh Deer,” so I went with that and decided that a vintage enamel bracelet would be nice. This is sort of costume jewelry that you would find in a thrift store. There is a necklace or bracelets for only $75L. I hope you like! Here’s a teleport to the store, the special is out at the front door! 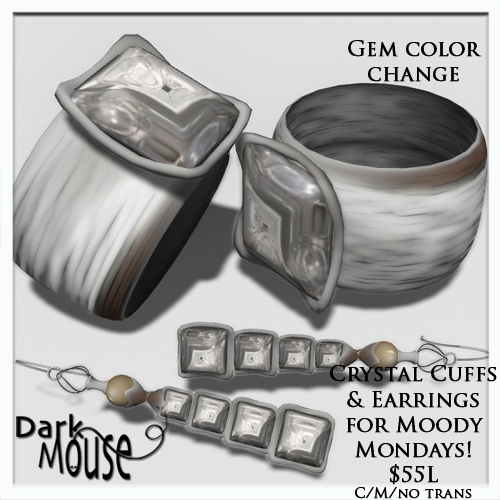 Dark Mouse at Jewelry Fair 2011! YAY! Finally – it’s Jewelry Fair time! I have several new releases all of them available at the fair. I also have several items set out in my booth for which 50% of the profits will go to OXFAM International the charity chosen by the organizers of the show. Last but not least, there’s a little gift on the table in my booth – FREE – just for visiting. I hope you do. Here’s a landmark to my booth at the show. I’m in the Witch Hunt which starts on September 15 (midnight tonight)! 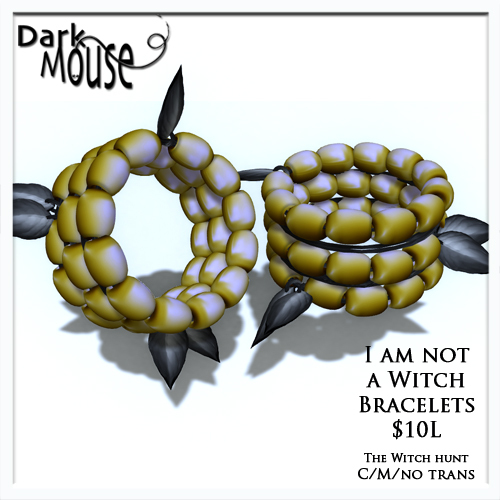 If you teleport to the Dark Mouse main store, you can gander around for a Witch hat, and if you click on the hat (when you find it!) you will get a lovely little prize from me! The hunt item is $10L. I hope you enjoy, and here’s a pic of my entry for the Witch Hunt! “I have been crystal-gazing, Headmaster,’ said Professor Trelawney, in her mistiest, most faraway voice, ‘and to my astonishment, I saw myself abandoning my solitary luncheon and coming to join you. Who am I to refuse the prompting of fate?” And on that note, I found myself feeling the need to blog, and who am I to refuse the promptings of fate?! I’ve been working on my releases for Jewelry Fair (only a few days away) and liked what I was wearing, and embellished a bit. I have been astonished by the creativity and skill I’m witnessing of late, and frankly a wee bit overwhelmed! There is that constant need to ‘keep-up’ as it were. So rather than worry about it, I started playing. I saw the dress that I’m wearing in a weekly event, and went looking for it after the fact. I’m not certain ‘why’ I like this dress. It may be the oh so delicate color and shading that I like. I paired it with a salmon colored sweater from Jane, oh she of the amazing mesh skills. This sweater is not mesh, but with its elongated sleeve, it feels retro modern to me. It also works well with the dress. The amazing bag from FIR & MNA is just big and carries all my virtual stuff (and was an incredible FLF bargain). I need this bag in RL actually. I decided to keep my legs bare – we are after all in that twilight time between summer and the dream of fall, so the day is warm, but I need a sweater (let’s pretend I’m in California…). The basics here – the skin is the new Jewel from Curio and the brows on this skin are well, perfect. They are heavy without being well, heavy. My hair is from Exile, and while I’ve been snapping up the hair on display at the Dressing Room sales, I have not been to the store in a while, and I found this breezy style in the new section. Look at the flyaway hair! Because I’m an oldbie, and well stubborn as the day is long, I’m wearing shoes without feet, and they are the Candy Clogs from Shiny Things. The jewelry is my own (ahem), the Whirling Dervish set – you’ll find this set at Jewelry Fair in just a few days – exclusively. The poses for this post are from Olive Juice. For me the whole look is a refusal to believe that summer is over, and yet it is. Full outfit credits below. Dark Mouse for Moody Mondays! Hi there, I’m in full prep mode for the upcoming jewelry fair, but taking a few minutes to participate in Moody Mondays this week. I have out a beautiful bracelets and earrings set called Crystal Cuffs..and the stones in the earrings and bracelet are color change, so you can coordinate. It’s like getting 8 sets in ONE! I hope you like and enjoy, only $55L, out in the store now! 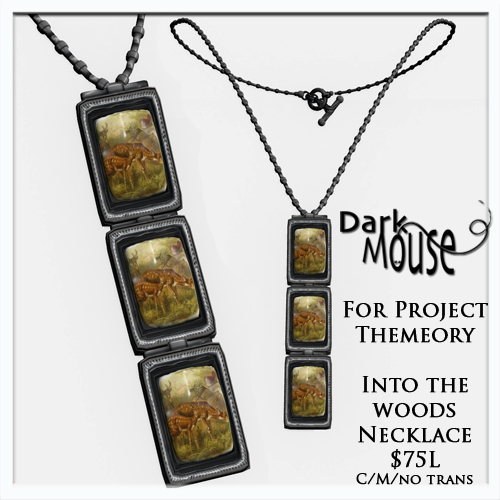 Click this link to teleport to my store, Dark Mouse.